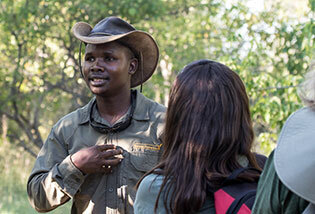 This year’s Bush Skills course took place at Okavango Guiding School’s Kwapa Camp at the bottom end of the Okavango Delta in Botswana. We were delighted to welcome several participants from the 2014 course plus new faces from both the USA and South Africa. The guiding school’s directors Mike and Bon Reed were on hand to manage the camp and assist with presentations to the group. 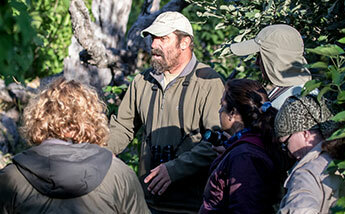 Lee Gutteridge and Rob Barber were our principal trainers, and together with Derek and Mike gave a series of illustrated talks on subjects ranging from animal behaviour and communication to insects, reptiles, birds and the make-up of the Okavango Delta. 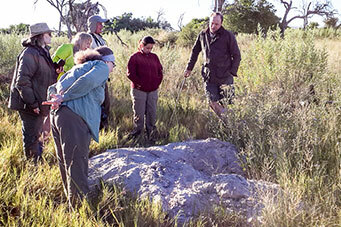 We were also fortunate to have Pat Malatsi join us for two days to lead walks focusing on the traditional and medicinal uses of the varied plants of the Okavango Delta. Each day our group enjoyed both drives and walks on the concession learning about the habitat and its wildlife with some great photo opportunities at the same time. Many of the mammals were rather skittish in the beginning but soon settled down to the presence of the safari vehicles though some of the elephants still provided a few exciting moments with mock charges. One of the major highlights was a young leopard carrying a tiny cub that suddenly crossed over the road right in front of one of the vehicles and then stopped in some thick grass to look at us before wandering down the track never to be seen again despite some intensive searching. It took everyone completely by surprise and we only managed to get some quick photos as it walked off down the track. 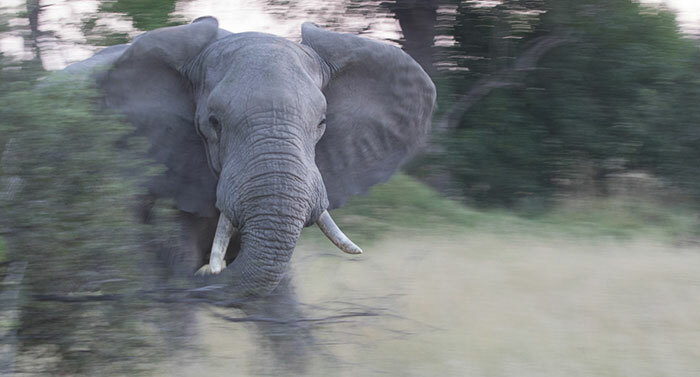 (Thanks to Mathi Mugica - one of our Bush Skills guests for this great photo). 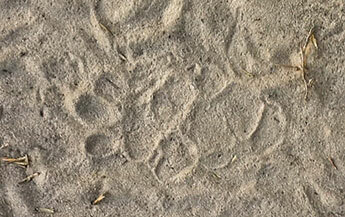 Daily walks with a major focus on tracks and tracking made very good use of Lee’s expertise in this field. 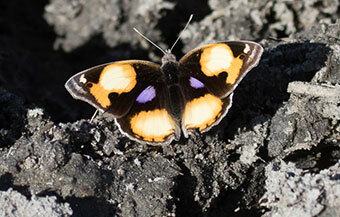 Learning about the smaller things on the walks was another important aspect and included tree, bird and insect identification particularly the huge numbers of butterflies feeding avidly on the extensive groves of cornflower vernonia flowers. Our stay was right in the middle of the impala rut with male impala chasing rivals all over the place and giving their bizarre roaring sounds throughout the day and all night long. 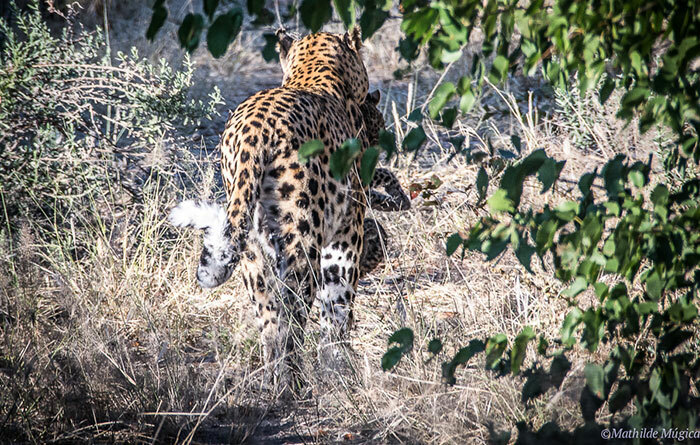 The resident leopard paid a visit to the camp each evening and Derek was able to record some great sounds of both leopard and impala during the week. 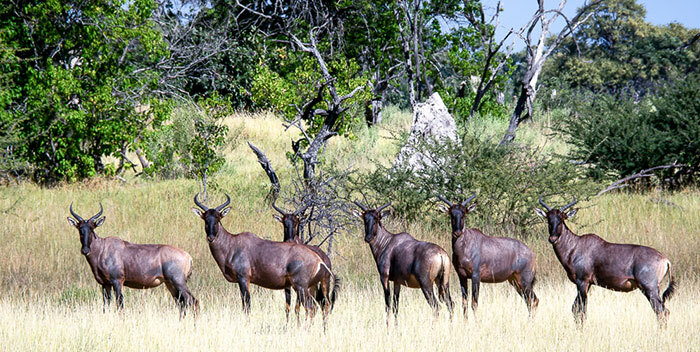 Listen to the impala rutting call here! Impala Chase - thanks again to Mathi Mugica - one of our Bush Skills guests - for this great image. One night the resident lions passed by camp in the early hours of the morning, roaring regularly with more great recording opportunities. Unfortunately they had disappeared by the time we got up to go and look for them, but you can listen to them here. Early one morning hyaenas started squabbling behind the tents - we thought that they had stolen a kill from the resident leopard and in between loud calls they could be heard crunching on the bones - listen to them here. During our stay the Delta was rapidly filling up from the floodwaters coming down from Angola but sadly had not yet reached the Kwapa concession. On our final day we took a long drive to an area where we hoped to find the moving water but with no luck though we did find several new mammals and birds for our species checklist including a large herd of buffalo running off in a huge cloud of dust. 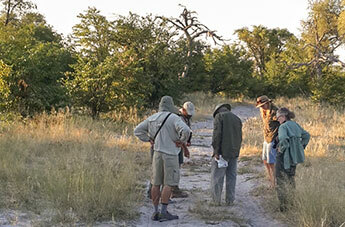 To finish off here are a few more images from the safari.